At least eight climbers died when a violent snowstorm destroyed their camp on a Himalayan peak in western Nepal. A rescue helicopter at the scene confirmed seeing eight bodies in the ruins of the camp, but was unable to stay due to bad weather conditions. The ninth climber has yet to be found but is feared dead. 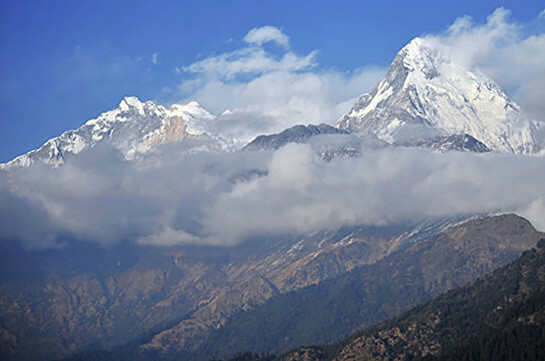 "Five South Korean climbers are dead, three Nepalese nationals are also dead. One Nepali guide is missing," police spokesman Sailesh Thapa told the BBC. "The camp was completely destroyed," the BBC heard from Myagdi district official Liladhar Adhikari. "[A recovery team] could see the bodies of the climbers scattered near the camp." He said another recovery team would be sent on Sunday, weather conditions permitting.